Burma Chronicles / Burma Tagebuch | Vorwärts und nicht vergessen! Aung San Suu Kyi soll demnächst wieder frei kommen. Hier ein Buchtipp ( bezeichnenderweise gibt es hier in good old germany kein vergleichbares Engagement), was etwa so ähnlich skandalös ist wie das Verhalten der deutschen Regierung im Fall Sakineh Ashtiani. On the occasion of the long-overdue release of Burma’s Nobel Peace Prize-winning pro-democracy leader Aung San Suu Kyi following seven years under house arrest, allow me to recommend quite possibly the best account of day-to-day life in the Southeast Asian “republic” run by an isolationist, astrology-influenced military junta: Guy DeLisle’s graphic novel, Burma Chronicles. 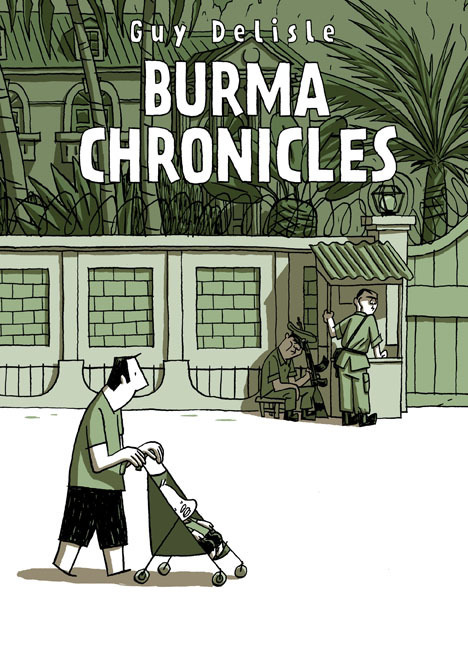 DeLisle, a Canadien cartoonist, follows his wife, an aid worker with Médecins Sans Frontières (Doctors Without Borders), to Burma, where he proceeds to take in the quotidian Burmese experience as a stranger in a strange land. Burma Chronicles is at once a travel guide the likes of which you won’t soon find in the Frommer’s aisle of your local book shop, and the private reflections of a casual observer trying to explain the inexplicable. After you’re finished devouring Burma Chronicles, make sure to check out DeLisle’s other graphic travel journals: Shenzhen: A Travelogue From China and Pyongyang: A Journey in North Korea. Der Tipp stammt aus : The daily what. Dieser Beitrag wurde unter Bundesregierung, Burma, Eine Welt, Politik, Politik und Gesellschaft, Reportage, Uncategorized abgelegt und mit Aung San Suu Kyi, Buchtipp, Burma, China, Chronicles, Chronik, Guy de Lisles, Tagebuch verschlagwortet. Setze ein Lesezeichen auf den Permalink.